It's that time of year again, when the weather is doing its best to remove as much lubricant and grease from your bike as possible; replacing it with grit, road salt and mud. Bike cleaning is a weekly, if not daily task, but it is one task that becomes a lot more manageable with the right kit. The 'Scrub and Buff' kit from UK brand Juice Lubes contains the essentials for a quick clean and re-lube. The Dirt Juice Bike Cleaner will help to clean the frame and wheels, and the concentrated version works well for chain cleaning in the highly effective Dirty Little Scrubber - one of the better chain cleaner designs I have seen to date. 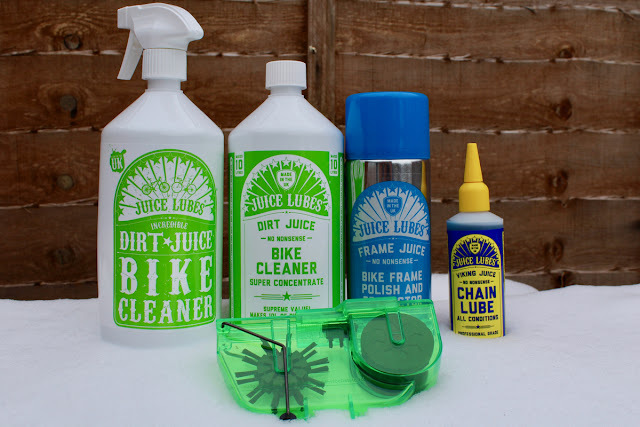 After you have washed and dried the bike, the Juice Lubes Frame Juice polish brings a shine back to components and parts, and also helps the dirt to wash off more easily the next time around. Perhaps the highlight of this collection though, is the Juice Lubes Viking Chain Lube. You apply it to a dry chain, ensuring overall coverage, and then you wipe off the excess; the lube doubles up as a cleaner and a lubricant. After the 'carrier' within the lubricant has dried, the chain is left running smoothly and silently, without any excess lubricant that might attract dust and dirt. Through cyclocross rides in the snow, mud, and torrential rain, the Viking Lube has kept my chain running well. The complete Scrub and Buff Bundle provides a cost effective option at £31 for the pack. The bike wash and refill should last a long time, while the polish and chain lube will help to keep your bike shining and running smooth for many months. Considering the cost of a new chain and components, investing in some quality clean and lube kit is money well spent.